Warren Area High School shortstop Ryan Rafalski forces out General McLane’s Nick Renick before throwing to first to complete a double play and finish off Warren’s 5-4 comeback in their Region 6 opener. Rafalski also had the game-tying hit in the fifth inning that chased GM starter Derek Fay. 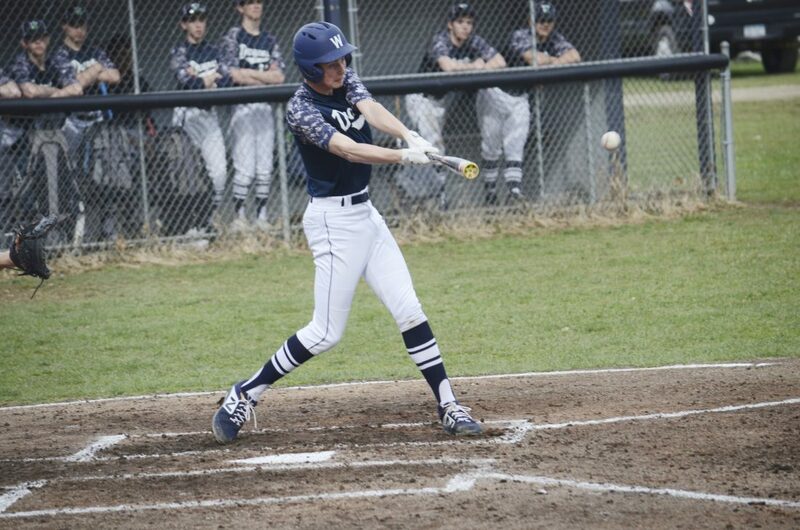 When they’re hitting the ball hard and the hits aren’t coming, there’s no panic from the Warren baseball team – they know they will come eventually. That was evident in Monday’s Region 6 opener against General McLane. Lancers starter Derek Fay kept the Dragon offense at bay through four innings, but that was it, as the Dragons scored four runs in the fifth, rallying from a 3-run deficit for a 5-4 win. 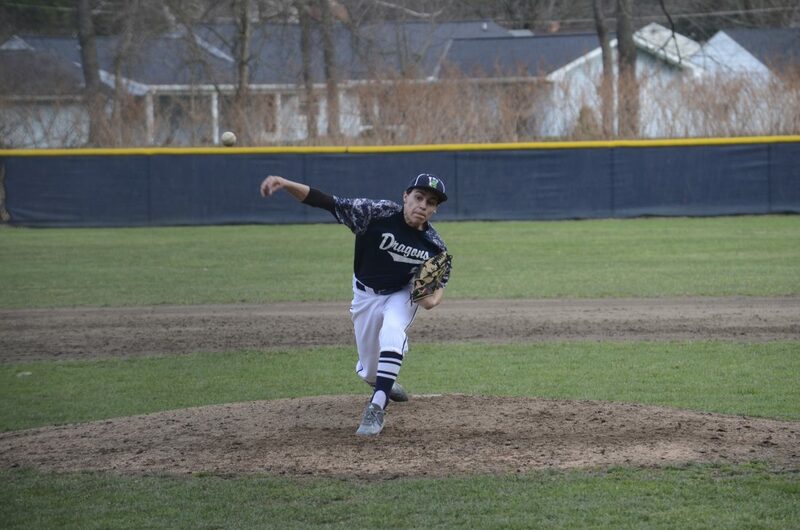 The Dragons rallied, and Hunter Loomis came on in relief of Mitch Grosch to earn his first varsity win. Loomis entered with the Dragons trailing 4-1, a runner on second and one out in the fifth and retired the first four batters he faced. 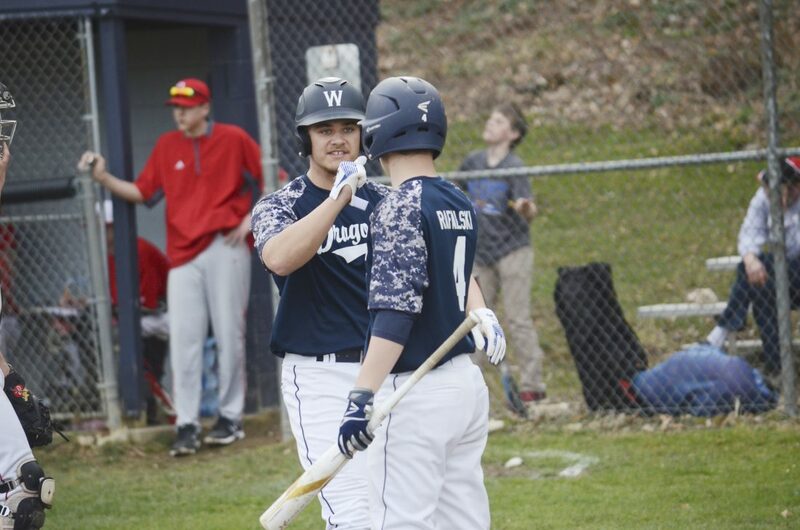 Warren’s Austyn Cummings fist bumps Ryan Rafalski after Cummings scored on Micah Passmore’s base hit in the fifth inning. Warren’s Ben Berdine delivers what turned out to be the game-winning run on a sacrifice fly in the fifth inning. Warren catcher Aidan Morrison slides to scoop up a swinging bunt. Warren’s Matt Loomis delivers a pitch during the sixth inning of Monday’s game against General McLane. Loomis pitched 2 1/3 shutout innings to earn the win in relief. Warren’s Caleb Ei returns a serve during a match against Rocky Grove at Betts Park, Monday, April 8, 2019. Ei won, 6-0, 6-0, to help lead the Dragons to a win over the Orioles. 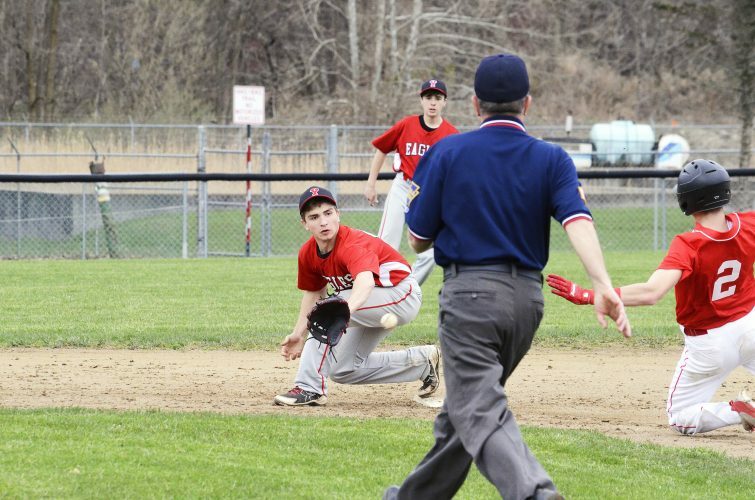 Warren’s AJ Seyler serves to his opponent during a match against Rocky Grove at Betts Park, Monday, April 9, 2019. Seyler and the Dragons defeated the Orioles for their first win of the season. Warren’s Elliott Neal returns a shot in doubles during a match against Rocky Grove at Betts Park, Monday, April 9, 2019. Neal and his partner, Aidan Colosimo, defeated the team of Webber/Moya, 6-0, 6-0, as the Dragons rolled to a 5-0 win over the Orioles. but was a bit unlucky. 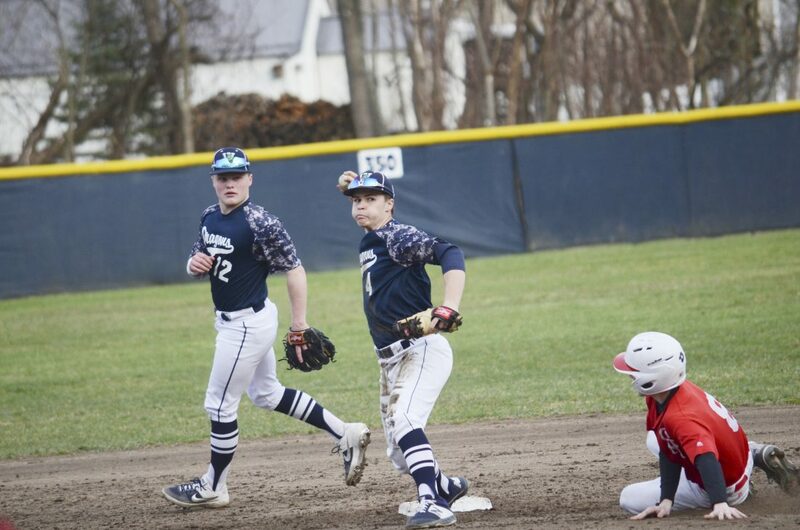 While the Dragons were hitting the ball hard and had little to show for it early, McLane, despite Grosch striking out seven, found some holes, including three-straight RBI singles in the third from Nick Renick, Justin Barstow and Chance Hoehn to race out to a 3-0 lead. James Swanson and Loomis both reached to start the bottom half of the third and Morrison drew his bases-loaded walk with two outs to get Warren (3-1 overall, 1-0 Region 6) on the board. Micah Passmore, who had a pair of hits and hit the ball hard every time he came up, was robbed by center fielder Matt Mountain on a ball that would have cleared the bases had it dropped. But the Dragons, whose vaunted lineup is well-documented, did get that big inning in the fifth. Austyn Cummings led off the frame with a double, Grosch drew the second of his three walks and Morrison had a hard-hit single to load the bases for Passmore, who hit a frozen rope that, coupled with a fielding error, brought in a pair to make it 4-3. Ryan Rafalski followed with a line-drive single that tied the game and chased Fay. Eli Buto came and Ben Berdine greeted him with a sacrifice fly, which ultimately turned out to be the game-winning run. The inning could have been even bigger for the Dragons, but Loomis lined into a tough-luck double play. 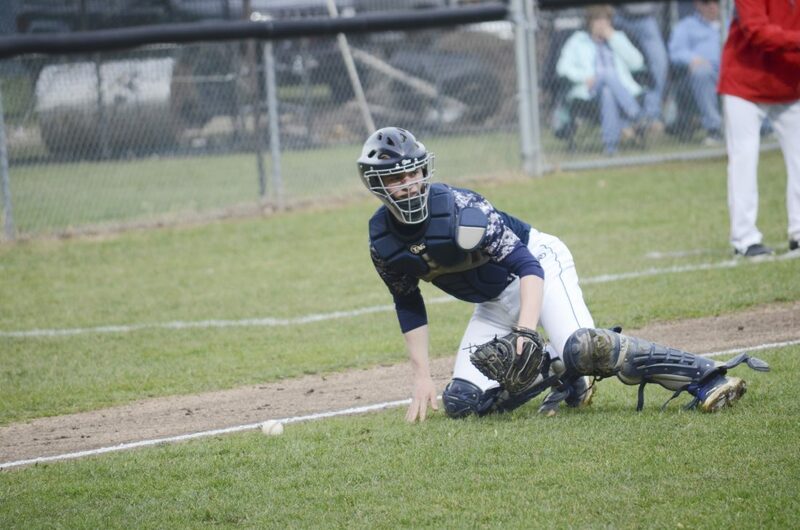 The Dragons were prevented insurance runs in the sixth when Morrison came on with two on and one out and lined into a double play, with Lancers (2-3, 0-1) shortstop Matt Leehan making a diving catch on yet another hard-hit ball. After recording the first two outs in the top of the sixth, Loomis yielded back-to-back singles, but got Fay to strikeout to end the threat, prompting a fist pump from Morrison. 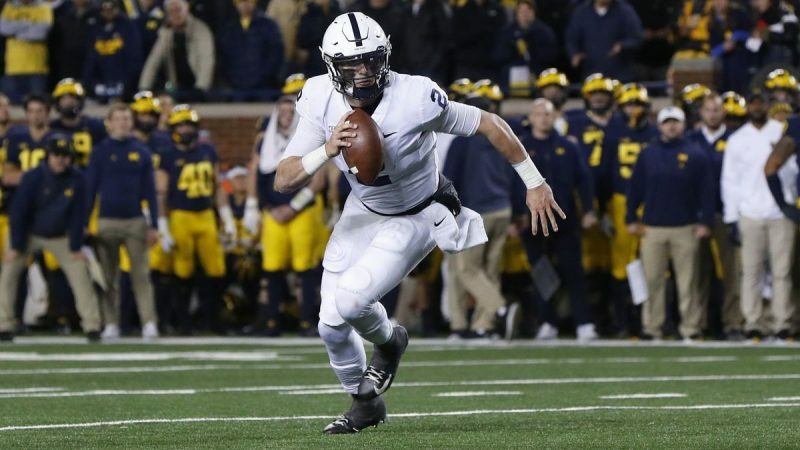 “I was confident in him going in there and throwing well,” Eaton said. With one on and one out in the seventh, Loomis induced a ground ball to short, which Rafalski was able to turn into a double play to end the game. Winning the region is high on Warren’s list of goals this season, and they know taking care of business early in the season is key. Double Plays: GM 3, Warren 1. 2B – Baldensperger (W), Cummings (W), Berdine (W), Leehan (G), Bastow (G). SF – Berdine (W). HBP – Grosch (by Fay). Nine different Dragons recorded hits in a 10-0 JV win. Dylan Maeder drove in two runs and also pitched three shutout innings in the win. Berdine, Ryan Arnold and Tyler Gustafson all pitched a scoreless inning as well.